It’s the time of year when fishing is great one day and then not so great the next. They are here today, gone tomorrow. The weather, mostly high wind, skewed fishing results a bit this week. The fish had been biting, then cold mornings and the wind slowed them down. Yesterday things were a bit better, but fishing was still not what it has been. White perch fishing along the channels at Lake D’Arbonne has slowed down. I sat on the channel Thursday afternoon with six boats where there had been 100 five days ago. I saw one fish caught. And no, it wasn’t me. Fish are on the move and are scattered between the deep water, the sloughs and the shallows. I think the full moon has messed them up, but that information is worth what you paid for it. A few fish are still being caught in 25-35 feet of water, but it seems most of the big ones are moving into the sloughs and 12-18 feet of water. Fishing for them has been slow, but some good ones are being caught. 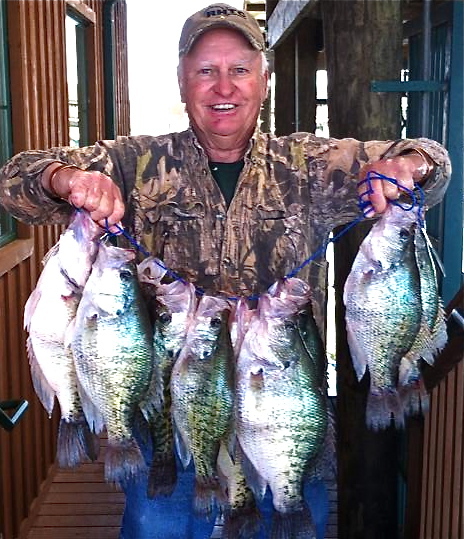 Last weekend’s Bayou State Crappie tournament yielded a bunch of fish near two pounds. That was the day before that full moon. Reports indicated the fish were caught in 10-15 feet of water near stumps on jigs. Some good catches are reported up the creeks on yo-yo’s in the shallow water at night. Bass fishing last weekend was phenomenal and there were a few good catches this week. However, again, the weather slowed things down this week. If you want to see some monster D’Arbonne fish and you missed it, look back at Monday’s report of the Fishers of Men tournament on the lake. Lake Claiborne’s patterns are very similar to Lake D’Arbonne, with white perch moving in shallower and most of the deep water action pretty much over. More fish seem to be shallow here, and the spawn is underway. Bass fishing has also been good for smaller to medium sized fish. Now to this week’s hotspot. Oh my goodness. The big fish have turned on at Poverty Point Reservoir. The photo here was from yesterday (yes, I know, AFTER the full moon). Nine fish that weighed 20.80 pounds. Fish are hitting in the shallower water there and it looks like the spawn is on. Look for this to be a busy spot this weekend. ONE FINAL NOTE – NOT ABOUT FISHING . . .
Don’t forget the annual Lake D’Arbonne State Park Car, Truck & Motorcyle show SATURDAY. It’s at the park — open at 10 a.m. to the public. The traditional Friday Night Ride from the Park into town will be at 6 p.m. Friday. Lake Darbonne is such a wonderful lake, I’ve loved sitting on the deck early in the morning drinking my coffee and looking at the flat calm mirror. Perfect for kayaking. I love the adventuring paddling up into little creeks and seeing all the wildlife. When I pass on I’ve told my family to have my body cremated and sprinkle my ashes into the lake. That’s how much I love this old lake. It was man made the year I was born, so me n the bonne are the same age. LOL. SINCERELY BEV BRISTER SARDIS LANDING. The best white perch fishing I have ever experienced was this past weekend (March 15th and 16th) on Lake D’arbonne. The owner of Andersons Bait and Tackle said that this is the best he has ever seen the white perch bite in 41 years of being in business. I was with 5 other friends at my camp and we kept over 200 white perch with 55 of them over 1.25 lbs, a handful of them close to 2lbs. It was a fishing trip I will never forget. We caught them fishing off the edge of the channel around 20 ft. deep with shiners.